ALBUQUERQUE, N.M. -- A revolutionary handheld laser device that in a few moments can detect and then track disorders of the blood has been patented in prototype by scientists at Sandia National Laboratories and the National Institutes of Health. The scanner, which makes blood samples part of the laser generation process, immediately detects sickle-cell anemia as well as nanometer-scale changes in cell structure like those imposed by the AIDS virus. The device, called a biocavity laser, also is better able to distinguish between cancerous and non-cancerous cells than pap smear tests, which analyze visually only relatively small numbers of cervical cells. For victims of terrorist biological or chemical attacks, the transportable unit is expected to greatly reduce the time needed to analyze dangerous materials invading the blood stream. Diagnosis could be made on the spot, thus facilitating treatment when speed is crucial. Widespread adoption of the device would end delays for patients in obtaining results from blood tests, when blood taken by a nurse is shipped to a lab for analysis. 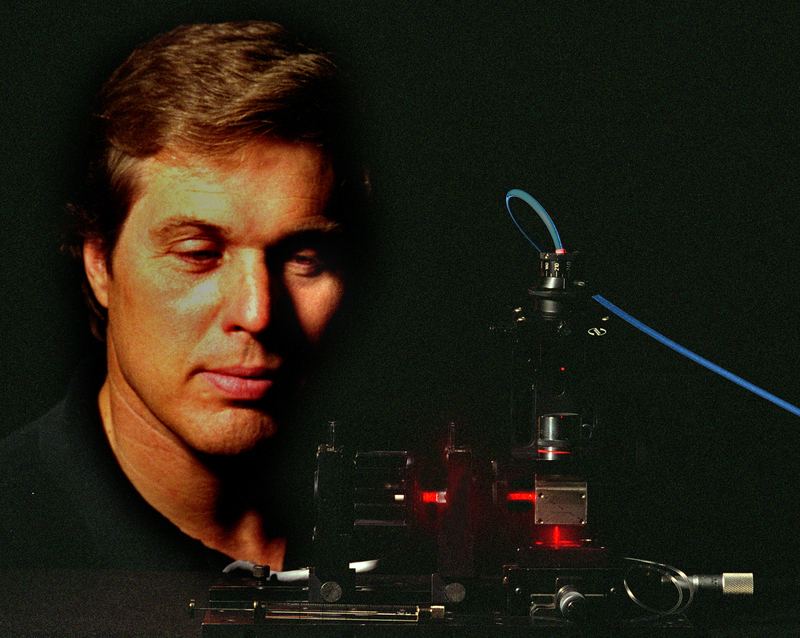 Princeton University physicist Robert Austin in Science described the biocavity laser as "really an innovative technology." Using it, says Paul Gourley, device project manager at Sandia, "It's possible to take a blood sample containing millions of cells and extract information about each cell in a few minutes. The results are quantifiable. If no cell is cancerous, we get a standard light signal. A cancerous cell gives a bright flash at different wavelengths." The work is funded by Sandia's Laboratory-Directed Research and Development program, which funds speculative defense-related projects, and by the US Department of Energy. Preliminary interest has been expressed by blood and cell analyses companies, and by pharmaceutical companies, says Gourley. 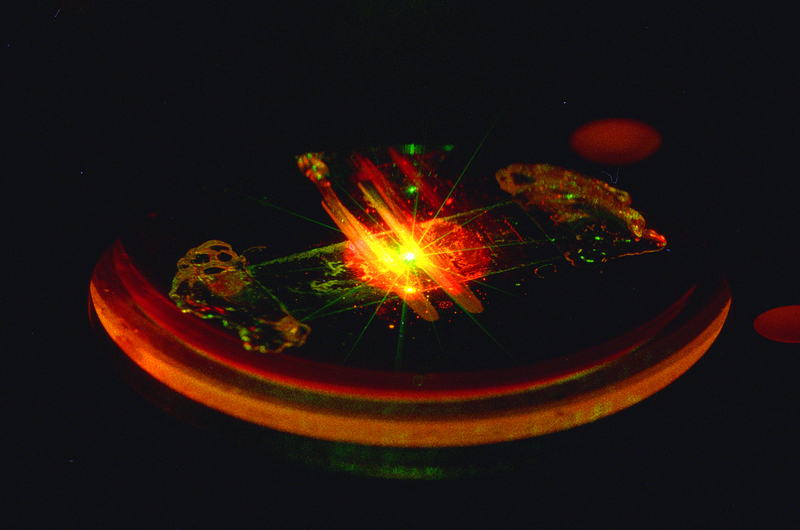 LAB ON A CHIP COMES CLOSER - A biocavity laser - a VCSEL capped by a glass plate enclosing a blood sample, all about the size of a quarter - is excited by a pump laser in Paul Gourley's lab. The VCSEL device can produce information about the state of millions of blood cells in a few minutes. It employs a laser device called a VCSEL - a vertical-cavity surface-emitting laser - that originates millions of tiny laser beams from an area roughly the size of a postage stamp. VCSELS were pioneered by Sandia's Gourley, together with his Labs' colleague Tim Drummond, in the mid 1980s. Instead of creating beams that pass through blood cells and then yield data, researchers insert blood samples into the laser itself to become part of the generation process of the VCSEL laser beams, altering them as they are formed. Above a specialized semiconductor, a coated glass mirror forms one end of the laser generating area. In the glass, through etched microgrooves each 1/10 the width of a human hair, a blood sample is pumped. The unique design allows blood components - red or white blood cells, or invading particulates - to become part of the lasing process. The components of the blood in effect modify the lasing light as it is created in the tiny laser cavity, thus permitting output light to be analyzed in a spectrometer to detect changes in cell sizes and shapes. Because the light reflects many times through a given sample - a consequence of the lasing process - the deviation in image created by the blood particle is magnified, greatly increasing the chances of positive, errorless identification. A sickle-shaped red blood cell is clearly distinguishable from a normal, more spherical cell. The components of a white blood cell, held inside the cavity, can be analyzed to see how it reacted to organisms or drugs in the blood, thus aiding in the design of new drugs. "After microsurgery to cut a white cell open and let out its proteins, we can see the extent of the material in a cell. Activated lymphocytes will show a larger volume and index of refraction change," says Gourley. Because the readout relies on light-emitting semiconductors, in most usages the cells do not have to be killed and stained - the most typical laboratory procedure. Instead, researchers can watch changes in cells as they occur - in "realtime." "The microcavity laser is basically a tool to study cell structure changes," says Gourley, "and could even be used for sequencing DNA." Present methods of analyzing living cells involve flow cytometers, which merely shine a laser light through one cell at a time. In wafer form, the device is activated by a laser microscope about the size of a telephone receiver that acts as an energy source and reads output from the biocavity laser like a supermarket scanner reads bar codes. To make a commercial biochip, quarter-sized electrical power sources already exist and bulky optical components would be replaced by an optical fiber, says Gourley. A small, no-frills system can distinguish between cells in a sample and offer a spectral analysis (without image) on a laptop computer for a cost between $5,000 to $15,000, Gourley estimates. A more complete setup for laboratory research to scan a laser over a surface or pump materials such as large quantities of blood through it would cost about $70,000. A brief note here comparing bioocavity lasers, VCSELs and ordinary lasers: Conventional lasers require mirrors set opposite each other to reflect light back into the generating substance - a crystal or gas - placed between them, to create still more light. Lasers made from semiconductors use their sharply cleaved ends as mirrors - light reflects because of the difference in speed of light in silicon and air, just as a glass window reflects images though it lets other light pass through. In the VCSEL, the semiconductor is not cleaved to provide a reflective surface. Rather, it is made by depositing alternating layers of tailored alloys. The layers are formed at exactly the distance from each other needed to reflect "in-phaseÓ light, so the beam's efficiency is very high. (In-phase means that the maximums and minimums of the created light occur at the same time, creating a powerful effect.) The beams also are created in a far smaller generating volume than the typical semiconductor laser, and many more beams can thus be created to light an area. In the medical device, the top layer of gallium aluminum arsenide and aluminum arsenide are replaced with the glass slide whose microgrooves carry blood. The lasing beams are varied by the quality and components of the blood through which they pass, and by the glass from which they are reflected. Sandia is a multiprogram Department of Energy laboratory operated by a subsidiary of Lockheed Martin Corp. With main facilities in Albuquerque and Livermore, Calif., Sandia has broad-based research and development programs contributing to national security, energy and environmental technologies, and economic competitiveness.